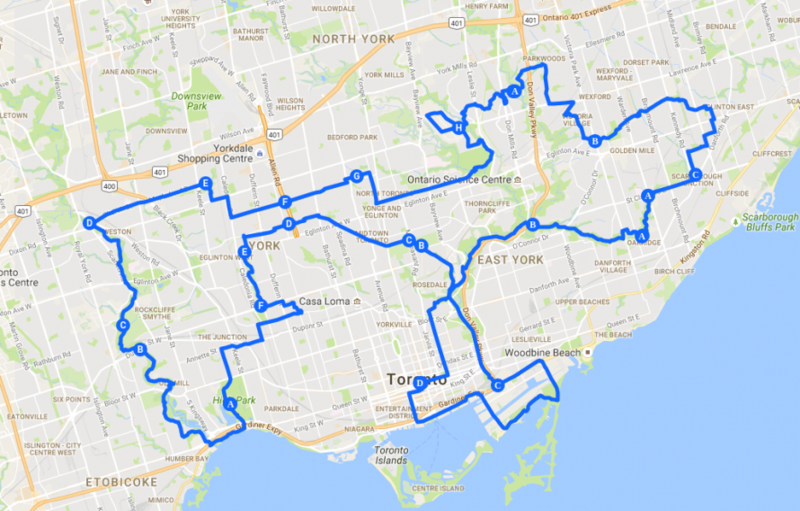 I was rooting through my old files and came across the 115 km route I mapped out around Toronto almost a decade ago (pdf). (The dog shape is purely coincidental). I was working at the City that summer as a Cycling Ambassador—mostly we went to events and gave out maps and info but we got a brief chance to create our own promotional event. I worked on this route. However, because of liability and insurance reasons I never did run a tour while working for the City. But I managed to do it once on my own time as a Bike Month event. There have been some improvements to suburban and urban cycling infrastructure (such as the Finch Hydro Corridor Trail) and Richmond/Adelaide cycle tracks) that it could be worth it to update this route to take in some of those sights. It's really hard to come up with good continuous bike routes in the burbs, particularly Scarborough. I can't blame people for just riding on the sidewalk instead of trying to search all the weaving residential streets to see which ones help get them to their destination and avoid those which dead-end. Even with this route, there are large chunks of Toronto still to be explored, including at least of Scarborough and southern Etobicoke. Feel free to print this turn-by-turn booklet, share it, clip it to your bike. And go explore! Was this the Century Ride that you organized one time? Yup, that's the one. I can't recall what I named it at the time. Perhaps the "Amazing Toronto Bike Tour" as the booklet suggests. I think you called it a Century ride, because you had just come back from NYC.